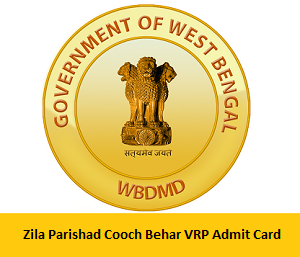 The Zila Parishad Cooch Behar VRP Admit Card 2017 will be out soon. District Social Audit Unit, Zilla Parishad, Cooch Behar official are planning to release the Hall Ticket. This Admit Card is useful to the candidates to take the written Exam and Viva voce. In the below of this page, we are providing a direct link for downloading the District Social Audit Unit admit card. By accessing this link aspirants can go to the official website. The District Social Audit Unit, Cooch Behar had revealed the Zila Parishad Cooch Behar Recruitment notification for the Village Resource Person vacancies. In total there are 380 vacancies. The officials are thinking to recruit the talented candidates for the village Resource Person post. On our website we had provided the complete details about the recruitment candidates can go through before applying. District Social Audit Unit, Cooch Behar Village Resource Person notification was released on 14th June 2017. The Online Application Process is opened from 16th June 2017. All the aspirants who are sincerely trying to get the job in the Government Sector can utilize this opportunity. Nowadays getting the government job is not an easy task. So many candidates whose dream is to crack a job in the government department are striving hard. There is still time to apply for the Village Resource Person Vacancies. The last date is 22nd June 2017. To avoid last minute rush all the interested applicants have to apply before the due date. Before all the aspirants have to check the details like Educational Qualification, Age Limit, Age Relaxation, Application Fee. The candidates whose age is between 18 to 35 years are suitable to apply for this post. The Category wise vacancies are specified in the official notification clearly so candidates can check them. After applying the officials will refer everyone application and will allot the hall ticket for the eligible candidates. Along with the admit card aspirants have to carry the ID Proof among one of the following. By this, the officials will verify whether the candidates belongs to this state. The Zila Parishad Cooch Behar VRP Exam consists of different subjects like English, General Knowledge, Aptitude, General Knowledge. The official exam pattern had not released the original exam pattern. We will update this page when the officials released officially. According to the notification, the officials of the Zila Parishad Cooch Behar will recruit the candidates by verifying their performance in the selection process. There is a high competition for the Village Resource Person Jobs so our advice to the aspirants has to prepare well for the exam to crack the exam easily. To make your preparation easy candidates can revise the Syllabus and Previous Papers from our website www.allindiajobs.in. For the easiness of the candidates, we are providing the simple steps in the below of this page. Candidates can follow this to download the Zila Parishad Cooch Behar VRP Admit Card 2017 from the official website. Go to the official Website of Zila Parishad Cooch Behar i.e; coochbehar.gov.in. Here find out the Notification on the home page. By clicking on that link candidates can see a page which appears on the screen. Now search for the Admit Card link and give a click on it. A page will display on the screen with the empty boxes. Here enter the required details like Registration number and Date of Birth. 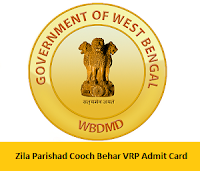 The Zila Parishad Cooch Behar VRP Admit Card 2017 will display on the screen. Now Save or take a print out for future use.